Ahhh, back in Minnesota where there’s no such thing as a parking garage. It’s a parking ramp. Tough day today — 103 miles in heat and humidity. We got up early and were on the road by 6:15. The earlier the better to beat the heat. The early going was fine — we had tailwinds and averaged over 18 miles per hour for the first several hours. I drank lots and lots of water and ate electrolyte gel bars to stay hydrated and avoid cramps. I also bundled ice cubes into a bandanna and tied it around my neck. 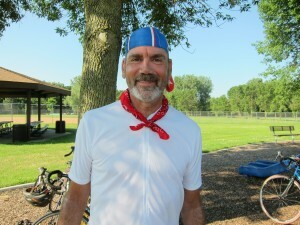 With my ‘do rag and my bandanna, I’m not sure if I looked like a pirate or a cowboy. But I’m sure I looked good. 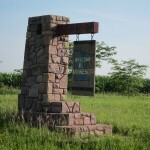 We went through small towns with names like Madelia, Windom, and St. James. I’m pretty sure that Madelia is the model for Lake Woebegone. (Of course, I thought that yesterday in the town of Luverne). Everything was fine until Mile 96 when I shredded my rear tire. This wasn’t just a tube that punctured. I hit something that sliced right through the tire. I carry a spare tube but my spare tire was in the mechanic’s van and who knows where that was. Fortunately, California Ann and Leslie stopped to help me. They taught me the dollar bill trick. The problem with a cut tire is that a new tube will simply expand into the same cut and rapidly puncture. Your really need a new tire. But if you don’t have one, you fold up a dollar bill and lay it inside the tire to cover the cut. When you put the new tube in, the dollar bill prevents it from expanding into the cut. (I asked Ann and Leslie if a $5 bill wouldn’t be better — higher cost, higher quality, etc. They convinced me that it wouldn’t.) So we put the dollar bill in, put in the new tube, re-assembled everything and — lo and behold — it all worked. For exactly five miles. At Mile 101, it was dead again. We tried pumping it up again but it only held for 100 yards or so. So, I walked the rest of the way. I’m going to claim credit for a 103 mile day but we’ll put in a little asterisk to explain that I rode 101 and walked two. The South Dakota chapter of the National MS Society threw a party yesterday to welcome us to Sioux Falls and to promote their Bike MS ride on August 6 and 7. They even had a rock and roll band — Exit 357 — with a lead singer named Travis. It was a lot of fun but just a little hot for an outdoor party. As a result, we hung out under shade tents rather than really rocking and rolling. Still, here’s a tip for you. If you’re ever in Sioux Falls and want to hear some good rock and roll, check out Exit 357. I’m not biased because their lead singer is named Travis. Their female vocalist was terrific, too. We were back in the saddle today for a quick 70 miler. Actually, it turned out to be a bit shorter than that. 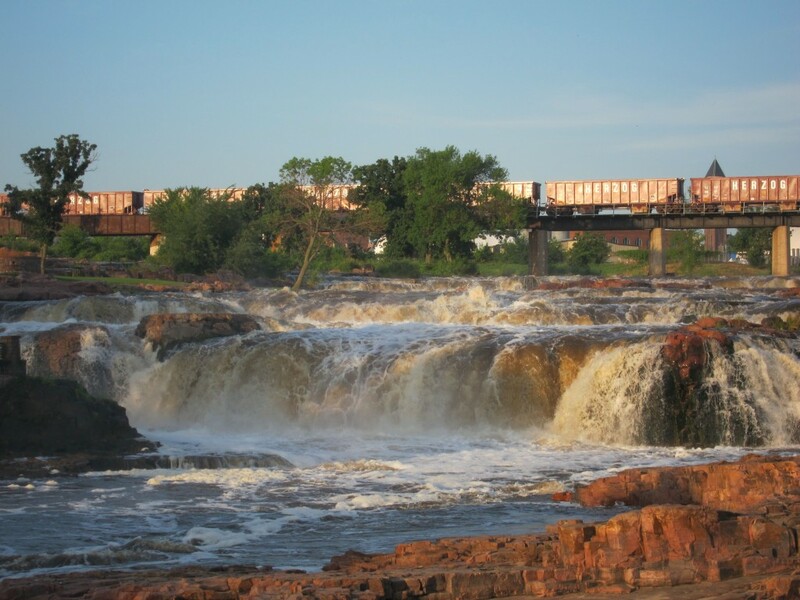 We planned to leave Sioux Falls along a nice bike path. Part of the path, however, is under water as the Sioux River has spilled over its banks. (Sound familiar?) The alternate route shaved three miles off the day and took us through some very pretty older neighborhoods and past Augustana College. We don’t normally get to see pretty neighborhoods so it was a nice change of pace. The other nice change was that we picked up a tailwind. Today’s route was very flat — I haven’t been in my granny gear for days now — and the tailwind pushed us along nicely. I arrived at our motel before noon. 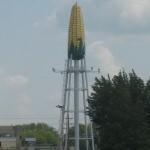 We’re now in Worthington, Minnesota which was originally founded as a railway station town in the 1870’s. The town is close to Lake Okabena so it was a convenient place for steam trains to take on more water. Not long after, some right-minded citizens decided to start a temperance colony where people could live “free of the sins of alcohol.” The leader of the group, A.P. Miller, named the colony after his wife’s maiden name: Worthington. I don’t know what happened to the colony but I hope I can get a beer here. 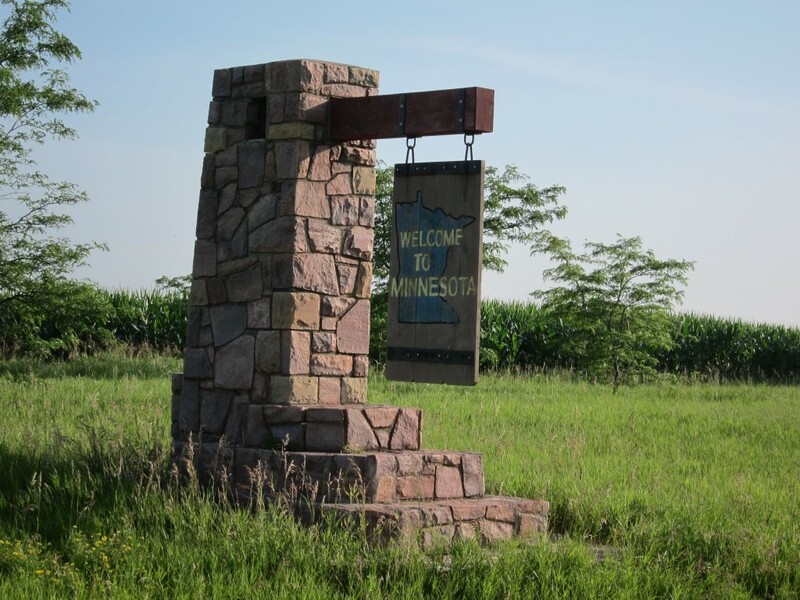 Entered our fifth state – Minnesota. Only five more to go, plus Ontario. Crossed two time zones — we’re now on Central Daylight Time. Passed the 2,000 mile mark. get ready for the coming week. Keeping up the calorie count is not as easy as it may sound. We’re burning some 3,000 to 4,000 calories per day as we ride. That’s over and above the normal calories we need just to stay alive. So we need to pack in the food. I wouldn’t say we’re eating high quality food but we’re definitely eating high quantity. I’m not sure that I’ve lost any weight so far but I’ve definitely reconfigured it. The new shorts that fit me perfectly when I left Denver, would now fall off me if I didn’t cinch my belt up tightly. Today, I’m doing more public relations activities. 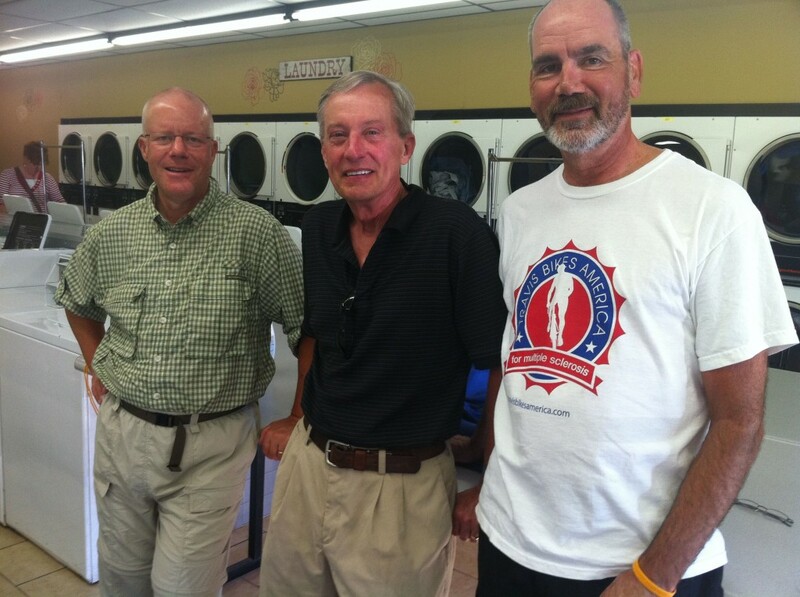 Since starting the ride, I’ve worked with the local chapters of the National MS Society to generate publicity and awareness. It’s a simple way for the chapters to generate free publicity and advertise their local programs. So far, I’ve done interviews with three TV stations, four radio networks, and five newspapers. 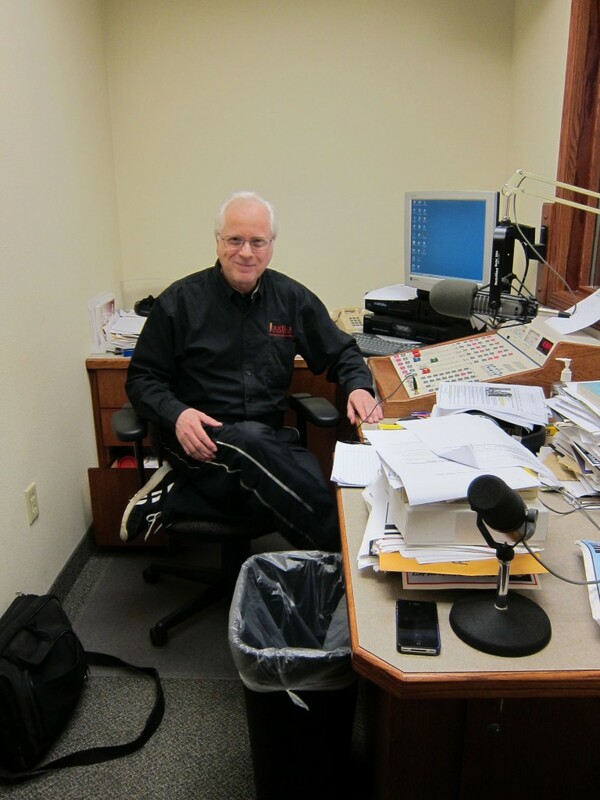 This morning, I did my first in-studio radio interview — with Jerry Dahmen of KXRB, a country/western station here in Sioux Falls. They’ll divide up the interview and play it all this week in a series called I Love Life. This afternoon, the South Dakota chapter of the MS Society will also host a party at a local pub to raise awareness and get people to sign up for the South Dakota MS-150 Bike Ride on August 6 and 7. (More info at www.myMSbike.org). 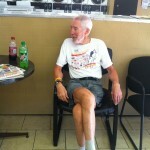 After a wild night at the laundromat, I think I need a nap before partying all afternoon. Today’s ride was “only” 73 miles but we expected heat and humidity so we started early. I was on the road by 6:40. We were greeted in the early going by a dense, cool fog. You could see 100 yards or so (three telephone poles) which was just enough to ride quickly. The cool, humid air was bracing and infinitely preferable to the blazing sun. 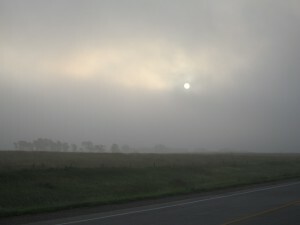 We were all hoping the fog would just stick around but, of course, it burned off as the sun rose. 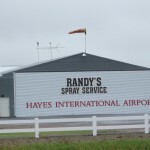 By 9:00, the fog had disappeared but high cirrus clouds kept us from the direct rays of the sun. 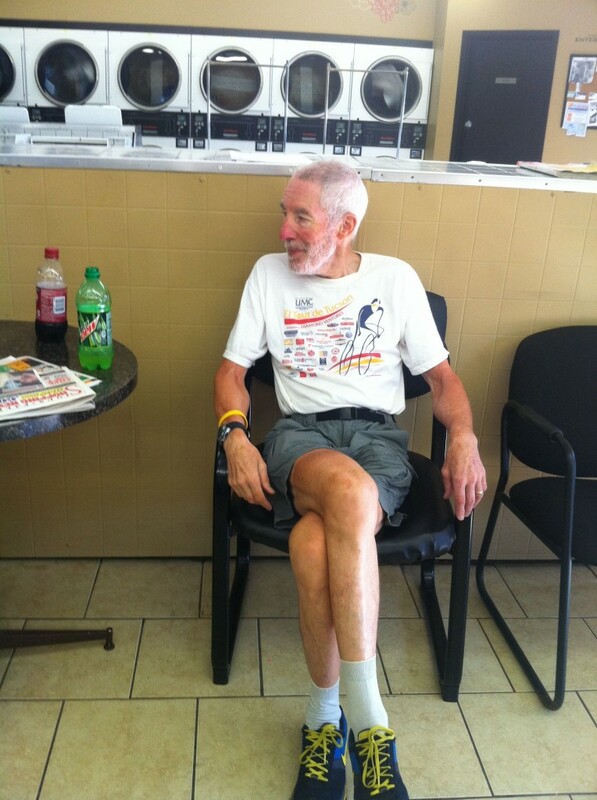 We stopped in Canistota to buy some groceries and relax for a spell. On a cool, clear morning in rural South Dakota, what do the locals do? Have a tractor pull. I always thought of a tractor pull as two tractors pulling against each other. The Canistota version — part of a statewide contest — was a bit different. This was a tractor you pedal while pulling a dead weight behind. The weight “digs in” so the farther you pull it, the more resistance it generates. We entered Science Mary in the women’s division. Science Mary is very strong but she was no match for the locals. Science Mary pulled the weight 15 feet; the winner pulled it 18 feet. Just wait ’til next year! Generally, the day went pretty well until I had a flat tire about 60 miles into the ride. I changed the tube, only to find the valve was broken and wouldn’t take any air. About the same time, Digital Bob showed up. Digital Bob has two (digital) cameras mounted fore and aft on his bike. He’s programmed them to take a picture once every minute. (Every time I pass Bob — which isn’t often — I smile and wave just in case the aft camera is about to shoot). Bob helped me with another tube and then took off. I finished up and then started off again — only to see Bob headed back my way with a flat tire of his own. I thought it was only be polite to stop and help him since he had just done the same for me. 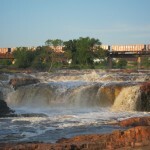 Now we’re in Sioux Falls and tomorrow is a rest day — which we’re all looking forward to. South Dakota was supposed to be easier than Oregon, Idaho, and Wyoming, but the headwinds and heat made the crossing just as difficult and perhaps more uncomfortable. We’re looking forward to turning north and finding cooler weather in Wisconsin, Michigan, and Ontario. A change in wind direction brightened my mood considerably today. After two days of headwinds, the wind calmed down today. For most of the ride, the wind was completely still. On occasion, it actually blew in the same direction we were traveling. Better yet, a brief rain storm sprinkled us early in the ride — just enough to cool everything off, but not enough to dampen our spirits. The terrain also flattened out — no long hills to climb today. As a result, our spirits picked up, our energy picked up and we finished our 73 mile ride through an agricultural landscape before noon. 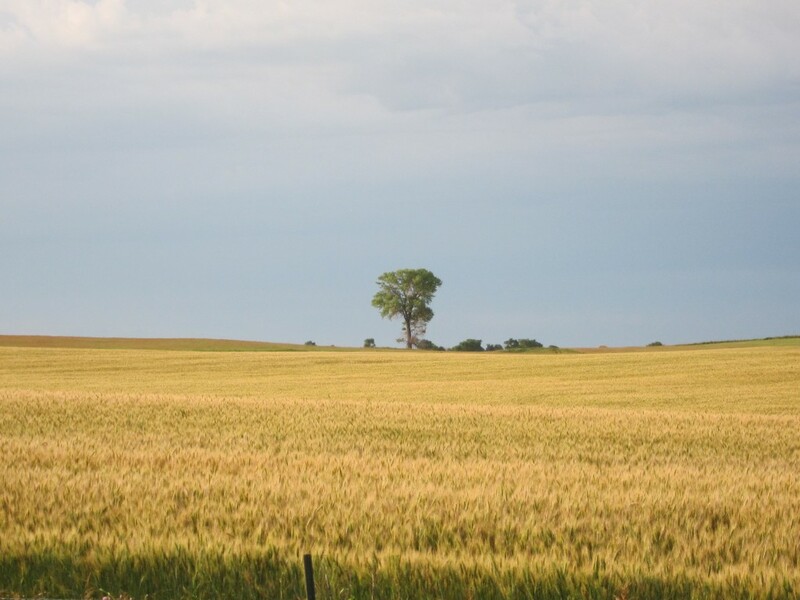 South Dakota, Mitchell is named after an important railwayman from the 19th century. The railway companies opened up this part of the country and built many of the towns as well as some beautiful lodges around national parks. 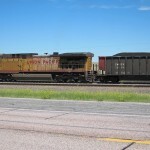 This is still the region where you can find mile-long trains carrying freight — especially coal — across the country. The trains are so long that going up and down a hill can be tricky. After cresting the hill, the front-end of the train needs to brake. But the back-end is still going up the hill and needs more power, not less. I’m somewhat envious of the high quality passenger rail service found in Europe. It turns out that the Europeans are very envious of the high quality freight rail service found here. We apparently have by far the best freight rail system in the world and that dramatically reduces our carbon footprint. If only those pesky Europeans would catch up. 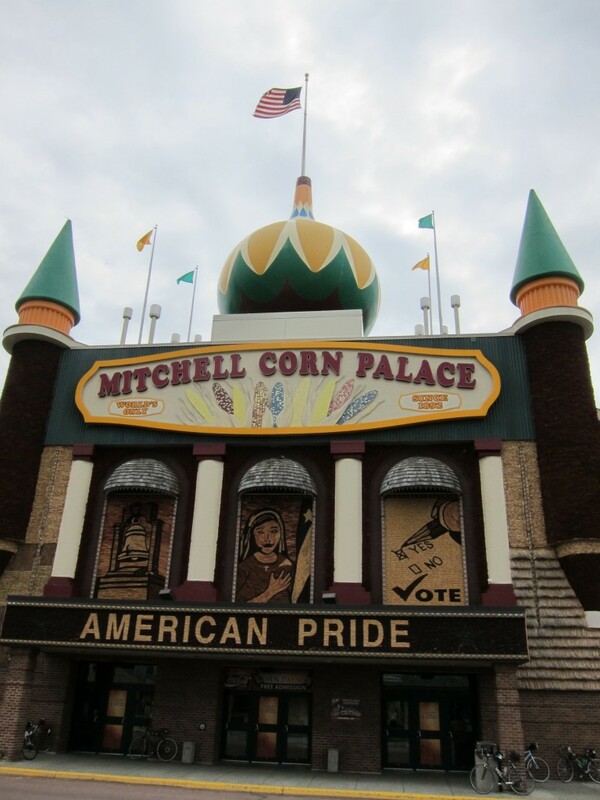 Mitchell, of course, is also home to the Corn Palace. While it sounds palatial, it’s about the size of an old fashioned large movie theater. 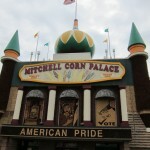 The outside is covered with corn. 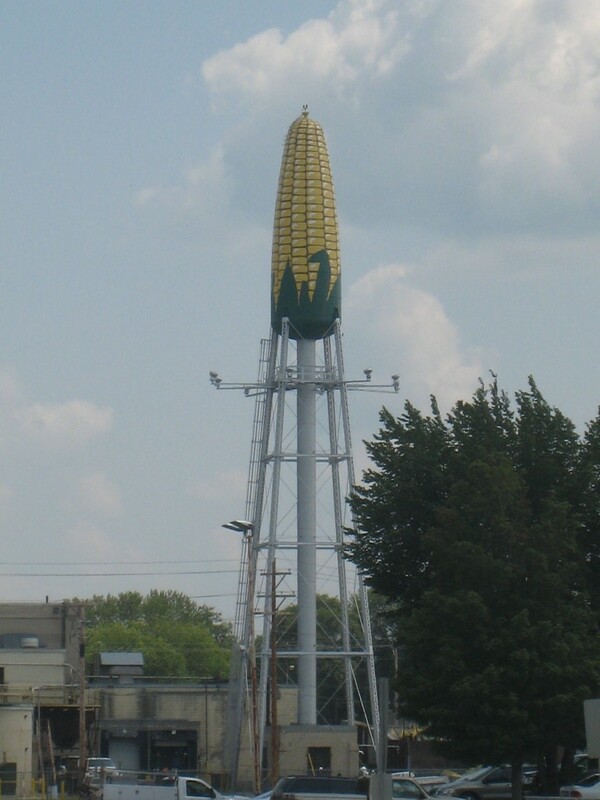 Each year, they come up with a new illustration for the exterior and then implement it in corn. It’s like painting with pixels except that each pixel is an ear of corn. Using different colors of corn, you can create lots of different illustrations. This year, they’re celebrating the 125th anniversary of Dakota Wesleyan University. (Go Tigers!) Inside, it’s a multi-purpose center, hosting everything from small trade fairs to basketball games. Imagine having your high school prom there. George McGovern did. There are a lot of flags in South Dakota and they all seemed to be pointing directly at us today as we battled a second day of stiff, steady headwinds. Yesterday we had rain to go with our headwinds. Today we had heat, hills, and humidity. Also, very rough roads that wound up bouncing us around quite a bit. We were all tired from yesterday’s saga so we were pedaling without much energy. 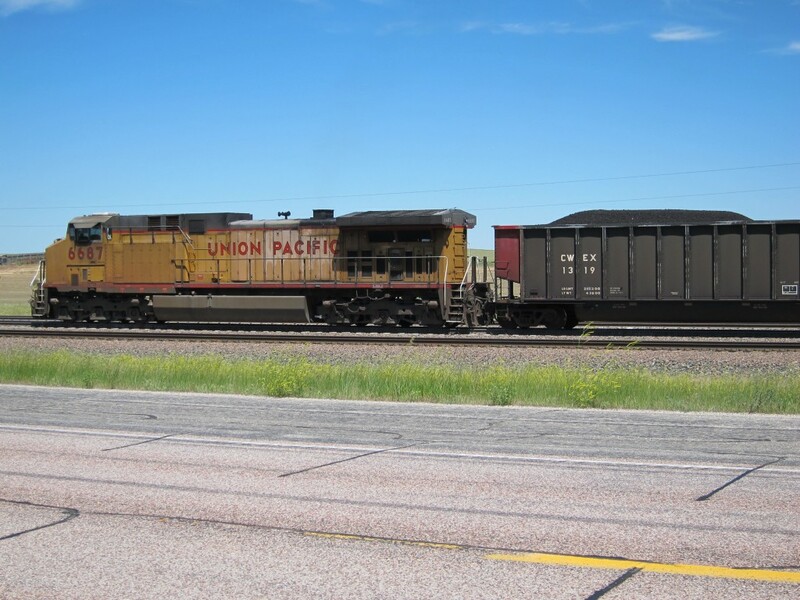 The Locomotive said that he cranked it up as hard as he could go and his power meter showed he was producing only 160 watts. (He’s a data-driven guy). My power meter is in my head and I’m sure it was registering much less than 160 watts. As a result, our average speed dropped precipitously. The good news on the day is that we passed the official halfway point. 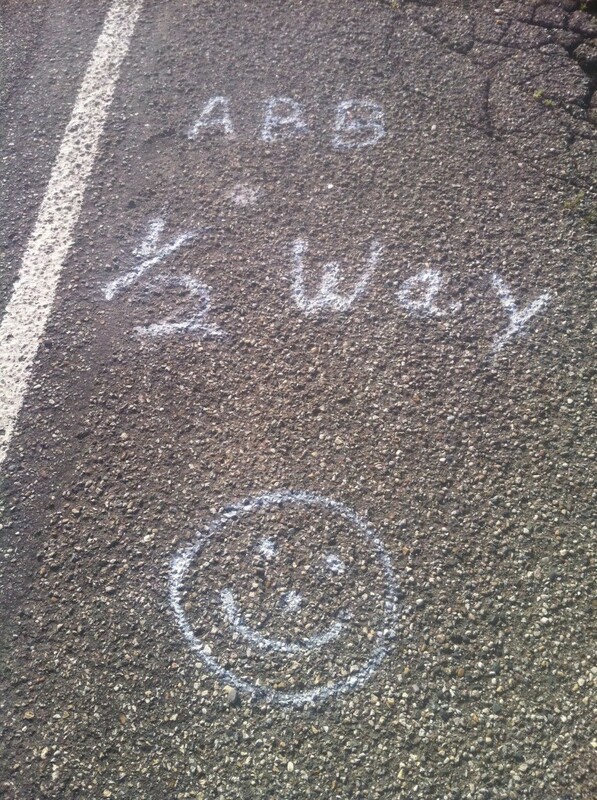 The company that organizes our trip, America By Bicycle, even painted a small monument on the asphalt. (By the way, the mileage I record is what’s on my odometer at the end of the day — not the official mileage from ABB. 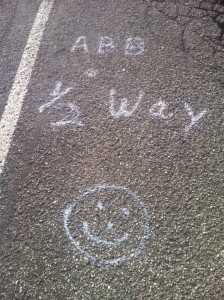 I sometimes take detours — or get lost — so my mileage is a bit higher than ABB’s). The other big news continues to be flooding. We’re following the Missouri River which is big even in normal times. Now it’s huge and lapping at roadways and the bottom of bridges. 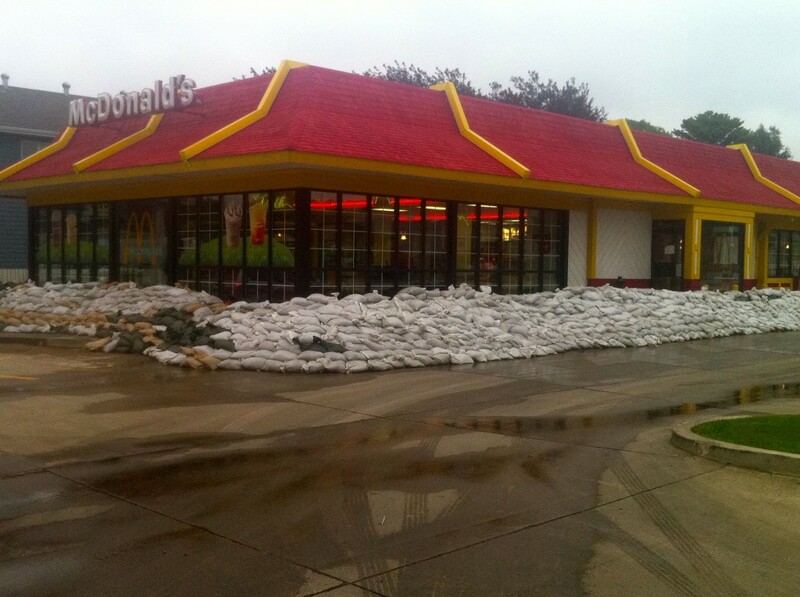 The local McDonald’s is not just serving sandwiches but also sandbagwiches. The locals have been very nice to us but they all seem a bit nervous about what might just happen. Now I’m in Chamberlain which is a pleasant little river town. It’s also the county seat for Brule county. Brule, of course, means “burnt” as in creme brulee. That suggests that we may get a lot more heat and humidity. Oh, joy. Have you ever gotten a song into your head and you just can’t get rid of it? Our ride today was 117 miles long and the weather forecast called for stiff headwinds and rain. I planned to not worry about speed but to slip into an easy gear and set a sustainable pace. How do you know if a pace is sustainable? My rule of thumb is simple: if I can sing a song while riding at a given pace, then the pace is sustainable. So I sang a song. 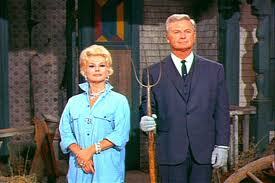 Interestingly, the only song that came to mind was the theme from Green Acres — so I sang it all day long. 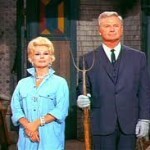 Even though Green Acres was one of the great TV shows of all time, I’d really like to get the theme song out of my head. Can anyone suggest an alternative? wind was blowing directly from the east so we had 100 miles of headwinds. It’s OK if you can find the right gear and hunker down. The complicating factor was the rain which came down in sheets almost all day long. With the wind, the rain turned horizontal and smacked you right in the face. I had on good rain gear so I stayed warm and reasonably dry but if Green Acres didn’t drive me nuts, the wind and rain certainly should have. Finally, after a long series of rolling hills, I spotted the Missouri River and rolled down into Pierre, the capital of South Dakota. As with all the other rivers we’ve seen, the Missouri seems close to flood stage. 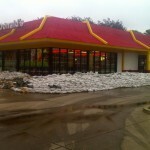 In fact, our hotel — about ¼ mile from the river — is already sandbagged. Longest day (3) — it wasn’t my longest day in terms of distance but it was in terms of time in the saddle: 9 hours, 3 minutes, 11 seconds. 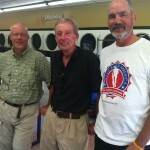 With the help of local chapters of the National MS Society, we’ve generated a lot of positive media attention for the MS ride. 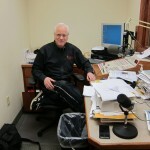 So far, I’ve done interviews with three TV stations, two radio stations, and three newspapers. In addition to generating awareness, I think we’ve also generated some new donations. I’ve also gotten a lot of questions about my life with MS and I’d like to devote today’s blog to answering them. I was diagnosed with MS three years ago when I was 58. There are four major forms of MS; I have the form known as Relapsing/Remitting MS (RRMS). I can be in remission for long periods of time but there is always the possibility of a relapse, during which time new symptoms can appear and old ones can resurface. My symptoms today are fairly mild — it feels like my right hand, right foot, and the right side of my head have gone to sleep. I haven’t lost any function but I have lost some sensation. I’ve been in remission since 2008. My symptoms haven’t gotten any worse but neither have they gotten appreciably better. My goal now is to avoid a relapse. For various reasons, my docs and I have concluded that I’m not a good candidate for drug therapies. There are three things I can do to reduce the risk of relapse: 1) reduce stress; 2) avoid infections; 3) stay in good physical condition. So I’ve retired, I wash my hands a lot, and I exercise regularly. Indeed, part of the reason I’m bicycling across America is to give myself a challenge that will help keep me in good shape. Journalists often ask if I’m not nervous about living on the “edge” — a relapse could cripple me. My answer is that life is uncertain but I’ve found that positive things happen much more frequently than negative things. I sometimes ask my friends a simple question: “Is the world a better place today than it was when you were born?” The answer is unanimous: of course it is. (Then I wonder why we seem so cranky so much of the time). So if the world is getting better and positive things happen much more frequently than negative things, then there’s a simple prescription for living: Let’s get on with it. I was in my granny gear early and often today as we entered the Black Hills. Usually we have a nice flat run for a dozen miles or so before we start climbing. Today, it was out the door and up the hill. We climbed a total of 5,100 feet today, just a few hundred feet shorter than the day when we did Teton Pass. We didn’t have one big pass but rather lots of smaller hills. The grades weren’t too difficult but some of the hills lasted for three or four miles. 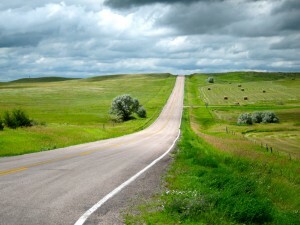 Then, we’d lose the altitude in a quick descent and have to regain it with another long hill. It’s beautiful territory but not easy cycling. 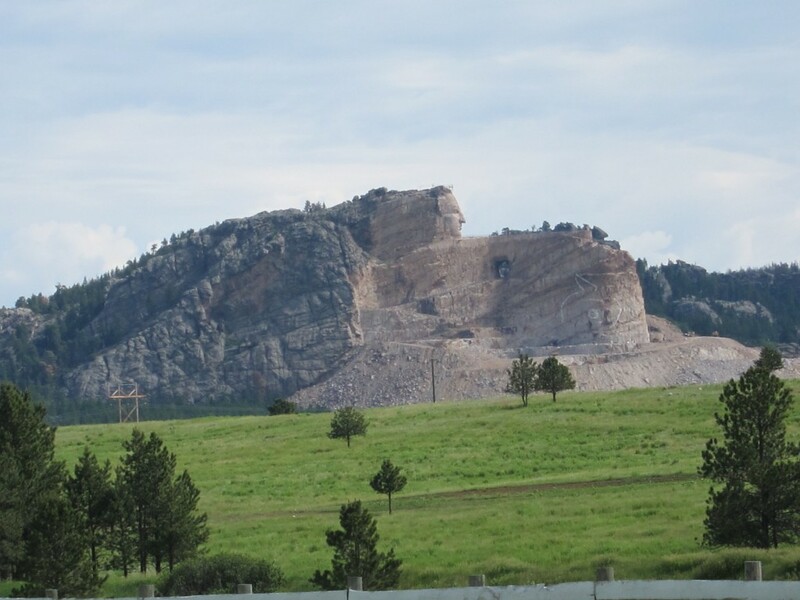 Along the way, we saw the Crazy Horse Monument. I’ve seen the models of what it’s supposed to look like when it’s finished and it should be really cool. Unfortunately, it’s a long way from being finished. 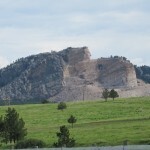 In fact, here’s a bet: we’ll cure MS before the Crazy Horse Monument is finished. 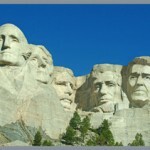 We also stopped at Mount Rushmore. For me the visit evoked memories of a cross-country trip I did with a friend’s family when I was 14 years old. It also evoked images of Cary Grant and Eva Marie Saint in North by Northwest, one of the thrillingest thrillers ever. 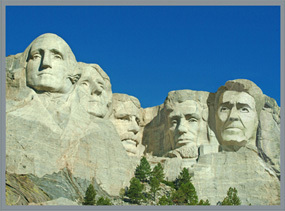 It was fun to see Mount Rushmore again but I was surprised that they had added Ronnie Reagan to it. 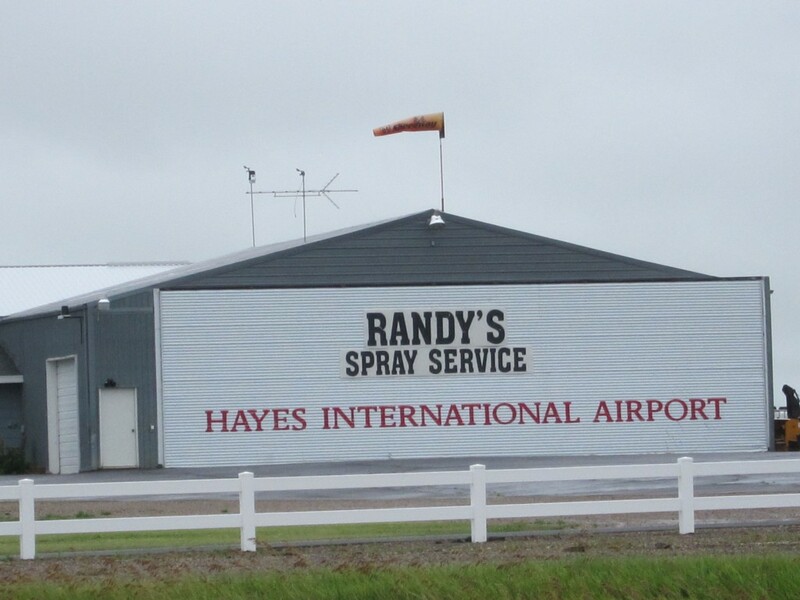 Now I’m in Rapid City which seems to be a city thriving on transportation, tourism, and agriculture. 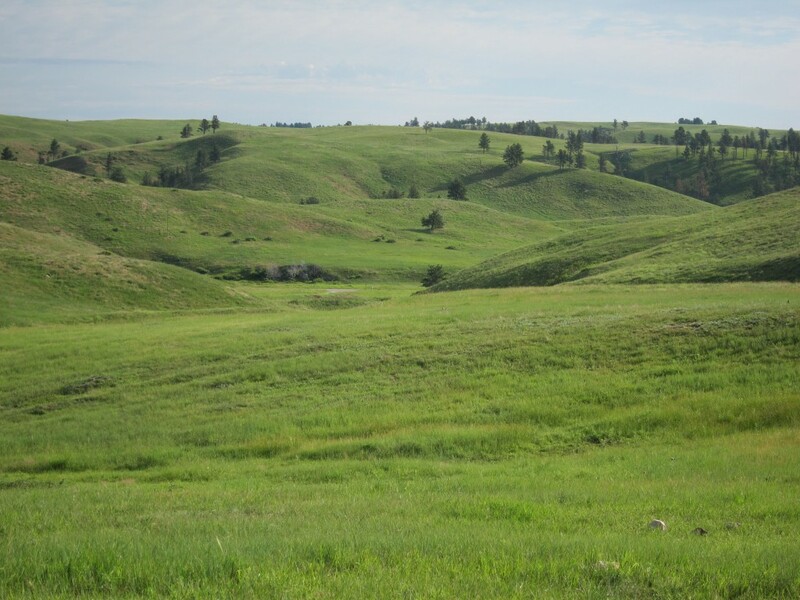 Interestingly, the entire city and several hundred square miles of surrounding territory may belong to the Sioux Indians. 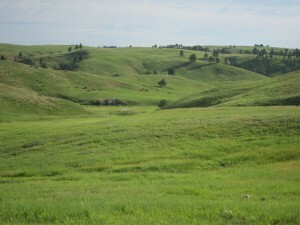 In 1980, the Supreme Court ruled that the United States had illegally stolen the Black Hills from the Sioux by breaking a treaty guaranteeing Sioux ownership of the area. 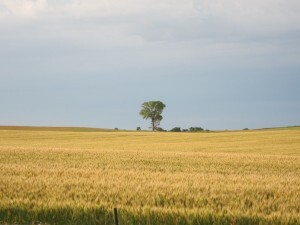 The court ruling offered monetary compensation but the Sioux said the land was not for sale. The question of ownership is still in dispute. Now, a special shout out to our next door neighbors, Colin and Finn (ages 9 and 6). Thanks for playing with Bella and giving her a new tennis ball. I know she loves playing with you two and she gets very excited. Do you think she’ll remember me?